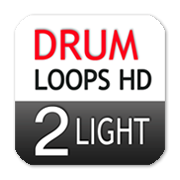 The free version of Drum Loops HD 2. In this Light version the ‘Blues’ chapter is fully functional (including Audiobus and Inter App Audio) and all loops, fills and samples in that chapter can be copied to Garageband or any other DAW for sequencing and programming. All other chapters have audio examples in 2 mixes to listen to and get inspired. A dry mix and a dry mix plus room mics mixed in, a ‘wet’ mix so to say, as you can find in all chapters in the full version.